eggs in hell | Is there any wine left? I am in mourning this week. My sister has abandoned me for endless parades, Sazeracs, jazz, beignets, French architecture, and good living. I guess it was only a matter of time before the allure of NOLA drew her back to the great state of Louisiana. I had two brief crying spells on Saturday after she left Houston and thought it was behind me. But then, I opened the fridge yesterday morning and started bawling all over again when I saw the half-empty jar of chunky marinara and the tube of breakfast sausage that she’d bought last week. 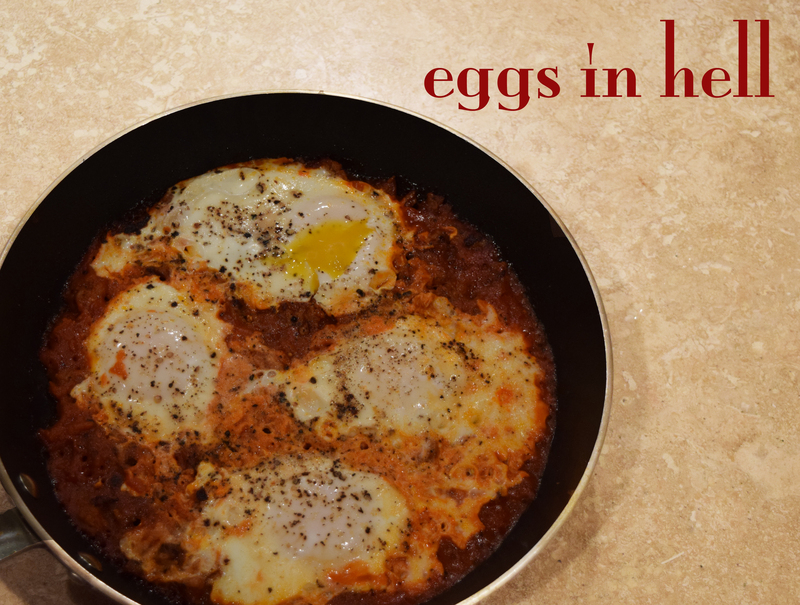 I needed comfort food stat, and Eggs in Hell is one of the easiest breakfasts to throw together. Everything happens in one pan and the dish comes together in less than 10 minutes, even though it tastes like you spent a lot longer on it. If you want to tone down the spice, you can easily make Eggs in Purgatory by cutting back on the cayenne (or omitting it completely). Brown sausage in a skillet over medium high heat, breaking it up with a spatula into small pieces. Cook until it is almost crispy. Stir the cayenne into the marinara sauce and then pour in the spiced sauce into the skillet and stir to combine with the sausage. Let cook 1 minute, until it is starting to bubble. Using a spoon, make a little well in the sauce and crack an egg into that space. Repeat with the remaining eggs. Sprinkle salt and pepper on the eggs. Cover skillet for 3-4 minutes, until whites are cooked through but yolks remain runny. Serve with toast to soak up the extra sauce. But what a fun reason to visit NOLA! This is one of my favorite lazy but feels homemade meals. It’s great over that leftover rice from Chinese takeout. If I have it, I toss a thick slice of buffalo mozzarella in the frying pan once the eggs are dished over the rice and let it melt a sec then slap that on top too. YUM Margaret! That sounds awesome! Oh man that looks good. I’m just over in BR- why have I never seen this? Found you from Holly Clegg’s blogroll. Will be trying several of your recipes. Keep up the good work!